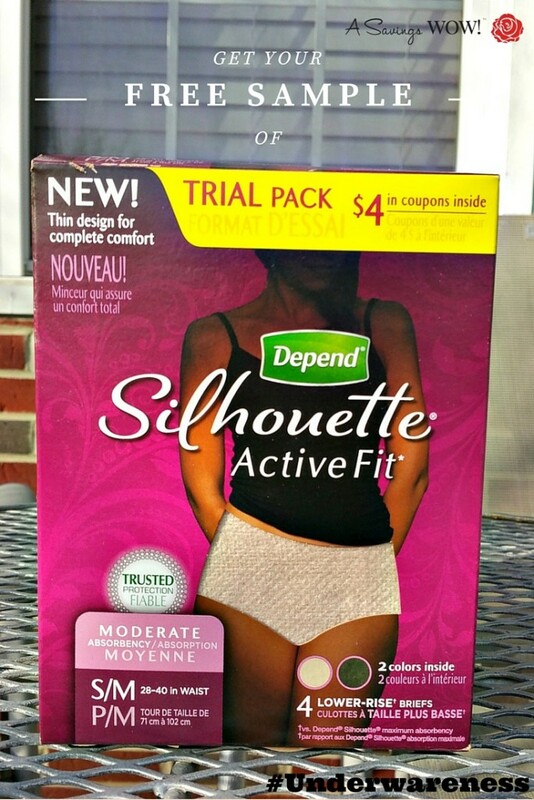 Free Sample of Depend Silhouette Active Fit | A Savings WOW! The first thing I want to tell you is that you’re not alone. It used to be a taboo thing to talk about – bladder leakage. However, it comes up in conversations with friends and what I’ve found out is that we’re not alone. I recently turned 45 and with also having had four children, my body has changed. I sometimes experience bladder leakage and am looking for bladder leakage protection options. Did you know that more people with bladder leakage are 50 or younger than 60 or older? Did you also know that more people with bladder leakage are in their 20’s than their 80’s? • With a lower rise, Depend Silhouette Active Fit briefs both fit and feel like real underwear. • Available in both black and beige colors, you can wear Depend Silhouette Active Fit briefs beneath your clingy, fashionable and cool clothing while still looking and feeling amazing! Depend is entering year three of Underwareness, a social movement and charitable cause to break down the bladder leakage stigma. As part of Underwareness, the Depend brand is encouraging people to show their support for women with bladder leakage. For every photo and video shared using #Underwareness and featuring Depend products, the Depend brand will donate $1, up to $3 million, through 2016 to fund charities that advance the research and education of bladder leakage. Plus, you can request a free sample of Depend Silhouette Active Fit when you visit www.Underwareness.com to support the cause .